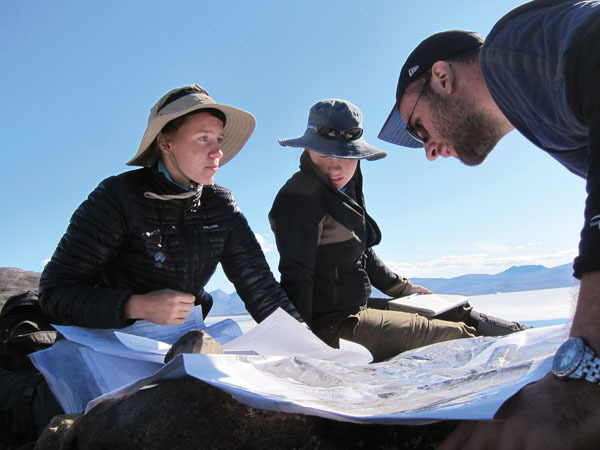 ARCTIC EXPLORATION: Undergraduate majors in geological sciences found their classroom in the High Arctic this summer, when they accompanied geophysics professor John Tarduno on an expedition funded by the National Science Foundation. 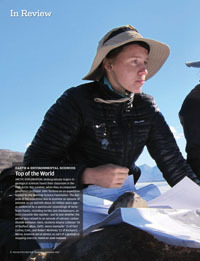 The purpose of the expedition was to examine an episode of extreme Arctic warmth about 90 million years ago—as evidenced by a spectacular assemblage of vertebrate fossils, including turtles and champosaurs, extinct crocodile-like reptiles—and to test whether the period was related to an episode of volcanic carbon dioxide emission. Here, students Alayna Callanan ’14 of Boxford, Mass. (left), Jenna Kaempfer ’15 of Fort Collins, Colo., and Robert McKinley ’13 of Rockport, Maine, examine aerial photos as part of a geological mapping exercise.